Telling the difference between huckleberries and blueberries is like playing a botanical puzzle where more than one piece fits each spot. The differences sometimes depend on geography more than botany. In different parts of the U.S., these common names may refer to different plant species or to one and the same plant. At first look, the plants and berries may seem the same, but differences run more than skin deep. Blueberries and huckleberries, both sometimes called bilberries, whortleberries or other common names, are members of the plant family Ericaceae and its subfamily Vaccinioideae. From there, blueberries and some huckleberries get sorted into different plant genera, and geography and common names enter in. Plants known as huckleberries in the eastern and southeastern U.S. belong to the plant genus Gaylussacia. Travel to the northwest, and native huckleberry species fall in the genus Vaccinium, the same genus of blueberries so widely enjoyed. The berries hold the key to why the different botanical names exist. Blueberries (Vaccinium spp.) earn their genus based on their flowers' ovaries. Split in two, the ovary shows five chambers, leading to numerous tiny seeds in mature fruit. Blueberries vary from other plants in the genus by the way they bear fruit. Blueberries fruit in clusters on wood grown during the previous year. The clustered growth makes blueberries capable of producing heavy crops. The two most widely domesticated blueberry species in the U.S. are highbush blueberries (Vaccinium corymbosum), which grow in U.S. Department of Agriculture plant hardiness zones 3 through 8, and lowbush blueberries (Vaccinium angustifolium), which grow in USDA zones 2 through 6. Like their blueberry brethren, Western huckleberries (Vaccinium spp.) have five chambers in the ovary. The flowers, leaves and fruit look similar to blueberries, but Western huckleberries produce single berries rather than clusters where their leaves join the stem, and they bear fruit on new shoots. Huckleberries resist domestication, so they are harvested from the wild. 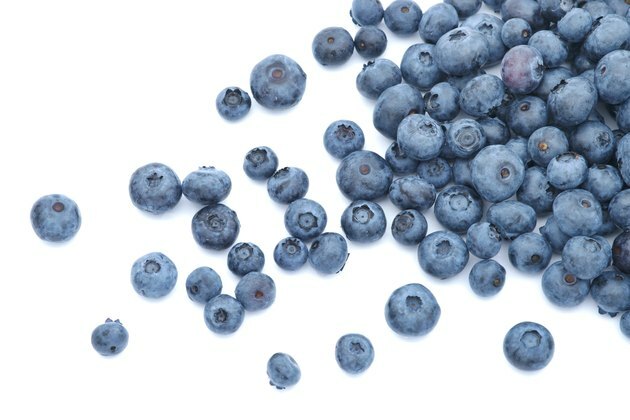 A single plant yields less than a blueberry plant does, but each fruit contains intense flavor-causing chemicals, making it more flavorful. The black huckleberry (Vaccinium membranaceum) is widely harvested for its black, purple or red fruit. Cascade huckleberries (Vaccinium deliciosum)have bright blue berries that are, as its species name suggests, delicious. Both grow in USDA zones 4 through 8. Eastern huckleberries (Gaylussacia spp.) are indistinguishable in some ways from their blueberry cousins. Their fruit forms in clusters. The flowers, fruit and leaves are often mistaken for rabbit-eye blueberries (Vaccinium ashei), a southern blueberry that grows in USDA zones 6 through 10. But split open an Eastern huckleberry flower's ovary and you'll find 10 chambers instead of five. 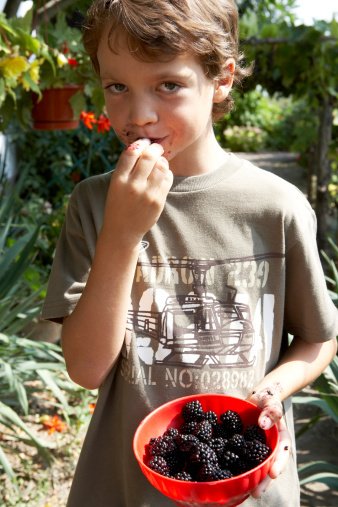 This creates large seeds and crunchy, seedy berries. The undersides of Eastern huckleberry leaves also carry yellow sticky resin not found on blueberries or Western huckleberries. The most widely grown species is the black huckleberry (Gaylussacia baccata), which grows in USDA zones 3 through 7. Sorting out berry differences gets more challenging when common names overlap. The Western dwarf huckleberry (Vaccinium caespitosum), which grows in USDA zones 4 through 8, also goes by the names dwarf blueberry, dwarf bilberry and dwarf whortleberry. A huckleberry imposter, known as the garden huckleberry (Solanum melanocerasum), grows as an annual like its nightshade-family relative, the tomato (Lycopersicon esculentum). Not edible until ripe and cooked, garden huckleberries are toxic and bitter when raw and unripe. It sneaks into huckleberry discussions based only on its common name.